← Seedball Making at LaGuardia Community College! 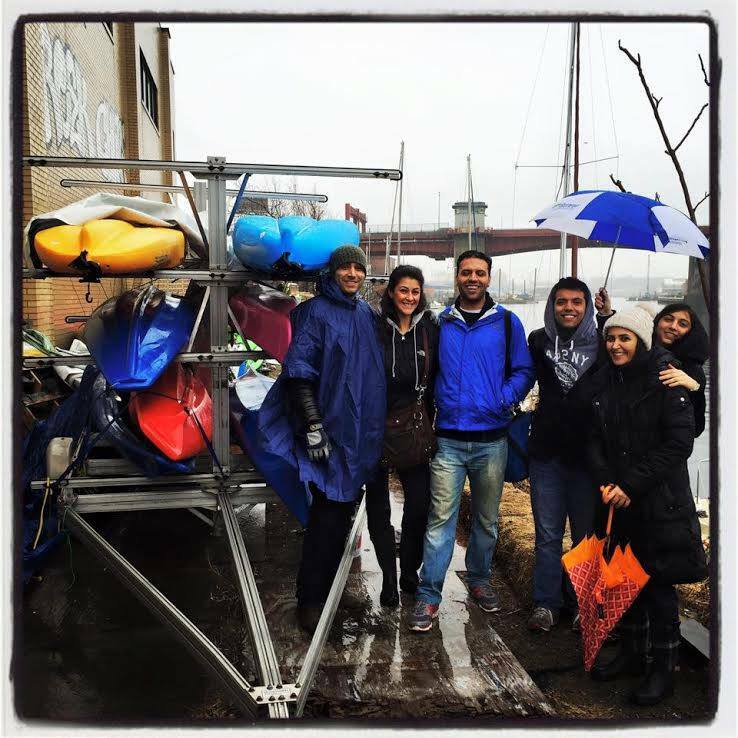 Norooz on the Newtown Creek! HarborLAB is grateful that volunteers from the National Iranian-American Council (NIAC) chose to celebrate Norooz, the Persian New Year, by helping us! Since ancient times, Persians and those influenced by their culture have heralded the new year with spring’s regeneration. Special foods and charitable acts mark the occasion, and on Saturday HarborLAB was the beneficiary of the latter. As for fireworks, those will come in the form of wildflowers exploding with color in warmer months, sustaining butterflies and bees who need new habitat areas more than ever! 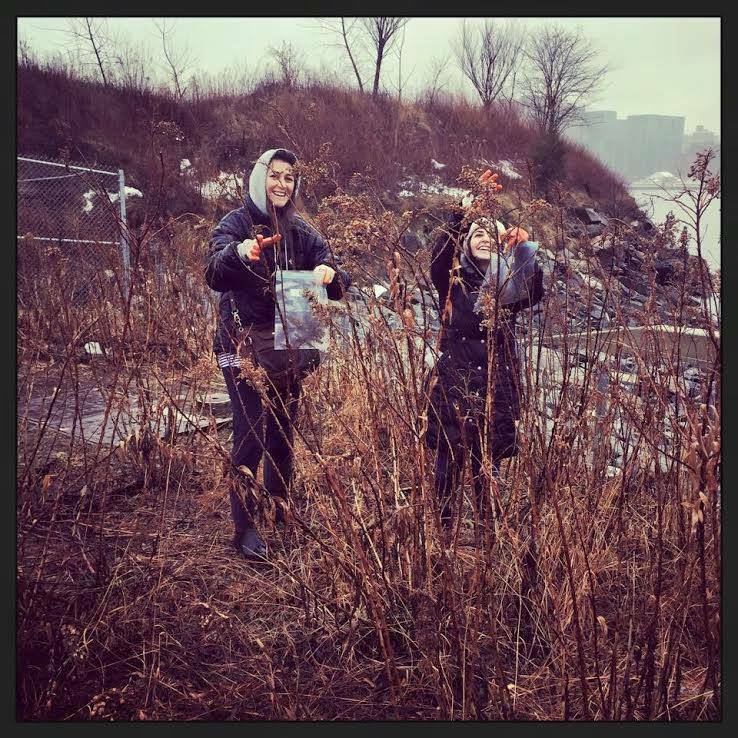 These hardy plants will also help stabilize shorelines, at the Newtown Creek GreenLaunch and beyond. An added bonus for us was that several of the volunteers were engineering students and graduates from the New Jersey Institute of Technology. NIAC event day organizer Matini Hekmat is a structural project manager at Tishman Construction, a unit of Newtown Creek stakeholder AECOM Company. Matini and his friends are kindly among those advising HarborLAB on our GreenLaunch goals, which rely on new, innovative structures and an accurate assessment of our lower bulkhead. Keeping our gathering lively and insightful was Kayvon Afshari, an accomplished journalist and host of the satirical Mideast Show! The incessant rain forced us to revamp of plans for the day from Newtown Creek GreenLaunch site work to a brief bit of seed gathering and then seed ball making. For instruction in this habitat restoration technique and a starter bag of dune grass and beach pea seeds, we’re grateful to Seedball NYC. For gathering most of our seeds (aster, pokeweed, goldenrod, milkweed, pine, and more), we’re grateful to HarborLAB volunteers, students from Hunters Point Community Middle School, and Baruch College, park managers for Gantry Plaza State Park and Hunters Point South Park, and expert guidance from Hunters Point Parks Conservancy Vice President Mark Christie. HarborLAB Founding Sponsor Green Apple Cleaners provided the red clay powder needed for our seedballs, and compost and other gear needed came in part via a Citizens Committee for NYC grant. Many thanks to all! As so often is the case, a special thanks to HarborLAB Facilities Manager Patricia Menje Erickson for helping make the day happen with her organizational skills and logistical support! With all that rain, we needed indoor space, and found it through our new friends at the Newtown Creek Group, a community service nexus for companies cooperating with the Environmental Protection Agency under a settlement to study pollution of the waterway, a Superfund site, with the aim of reversing the damage. Deep thanks to Tyquana Henderson Parsons of Connective Strategies, which represents the Newtown Creek Group, for helping find options, and to the group’s attorney, Marc Lavaia for hosting us at The Powerhouse in LIC at Ms. Henderson-Parson’s request.